This week I’m at Alumaflamingo in Florida, which is one of the events we occasionally run around the USA. Everything’s going well here and all the attendees seem to be having a good time, but I’m in hell … White Box Hell. That’s because I’m in a rented trailer, provided by the campground. I had to fly to Florida because I didn’t have time to make the 4,000 mile roundtrip this winter, and there was literally no other place for me to stay during this week. It’s the annual “Speedweeks” at Daytona and all the accommodations are taken. On one hand this is a good opportunity to see what travel trailer life is like when you don’t have an Airstream. I suppose I could say that this broadens my perspective and perhaps instills new appreciation for the difference in quality when you step up to an Airstream. But it’s also a shock. This ain’t no Airstream 2 Go, it’s a relatively low-end white box even for an industry that’s not generally known for quality. The maker of this trailer, Pilgrim, died in 2008 as an early victim of the recession, so there aren’t any units less than nine years old. 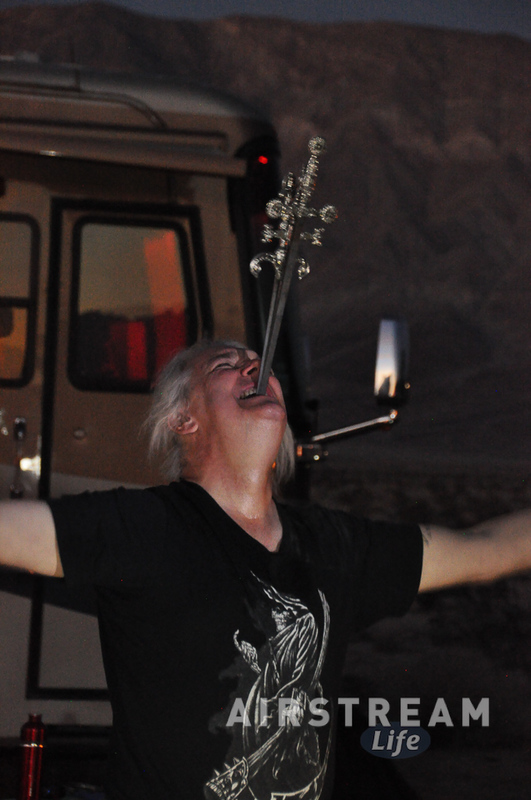 Nine years is nothing for an Airstream, but it is a long time for the average white box trailer. This one is typical: the exterior corners have begun to split and separate, the thin plastic vents have cracked, the ceiling has large water stains from roof leaks, and the furniture is starting to pull apart at the staples. That’s even more disturbing because this particular unit never travels. It’s an on-site rental only. 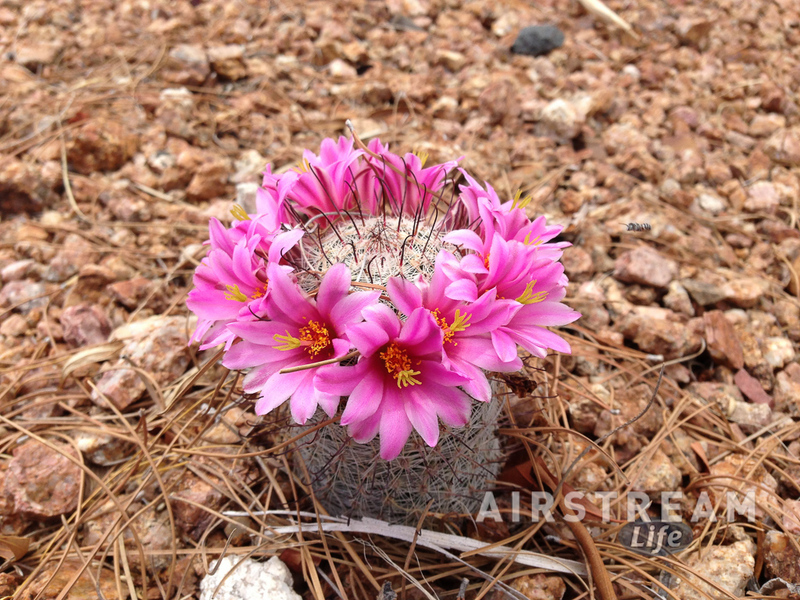 It never will travel thanks to moisture rising from the damp Florida soil. 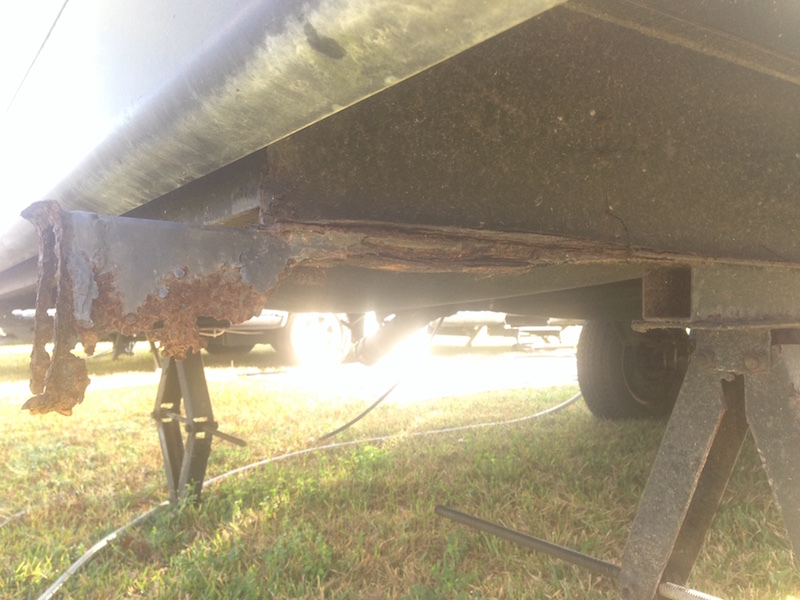 The exposed lightweight steel frame beneath has rusted away. I sometimes hear Airstreamers complaining about the mattress in their new trailer, but they wouldn’t if they tried the one I’ve been on for the past week. It’s a lumpy and thin thing that barely insulates from the hard plywood below. At night it’s always cold because there’s a huge uninsulated storage compartment directly beneath. I’d rather sleep on my Therm-A-Rest camping mattress. The only thing I like about the trailer is the ducted air conditioning, which Airstream added across their line a couple of years ago. 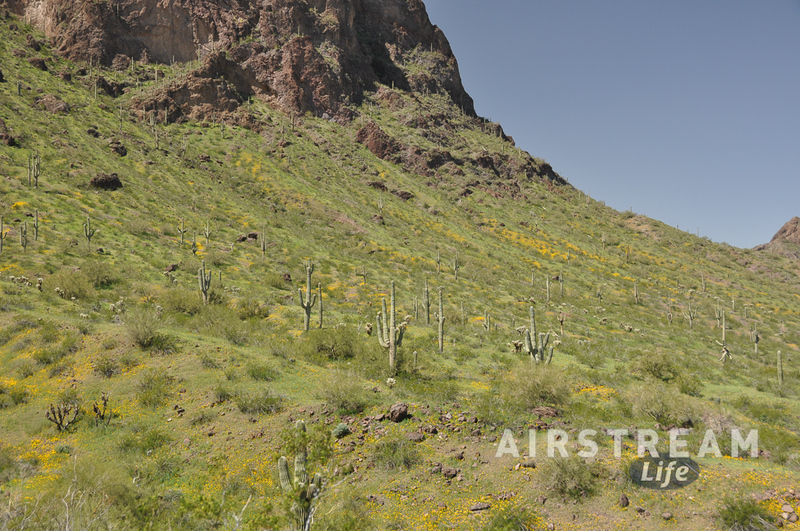 Airstream’s ducted air is whisper-quiet. The Pilgrim’s air is somewhat noisy but still far better than the old style of air conditioner that sounds like a jet blast. I’ve done what I can to make this trailer “home” for the week and—to count my blessings—it is a reasonably comfortable place to eat, sleep, and shower. I shouldn’t complain too much about it. My point is only that had I started RVing with a trailer like this, I would be astonished and envious looking at the new Airstreams available today. And yes, I’d be thinking that the $20k or so I spent on my white box is a lot less than the $40-70k for an equivalent length Airstream … and then I’d think: how can I swing that payment? 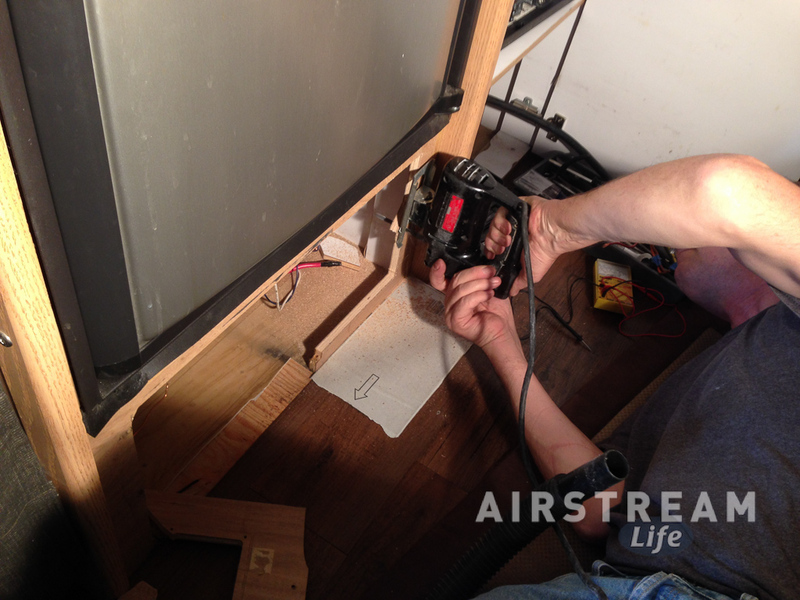 Because the Airstream is a better product in almost every way, and it will last a lifetime with good care. The white box I’m in today is destined for a landfill in a few years. When you look at it that way, you see how an Airstream is a really good value over the long run. Perhaps this is the ultimate and final power system upgrade on our Airstream. I certainly hope so. Over the years we’ve installed solar panels, bigger batteries, an amp-hour meter, an upgraded (Intellipower) power converter-charger (which we replaced with a Xantrex converter-charger), even bigger batteries, and finally a fancy Xantrex converter-charger-inverter. It has been a great learning process and I really like how the capabilities of our Airstream have been enhanced, but … please … let this be the last electrical upgrade we do on this trailer. We discovered an issue with the Xantrex converter-charger-inverter installation that I’ve already described in a prior post, and I’ve been preparing for the last month or so to deal with it. 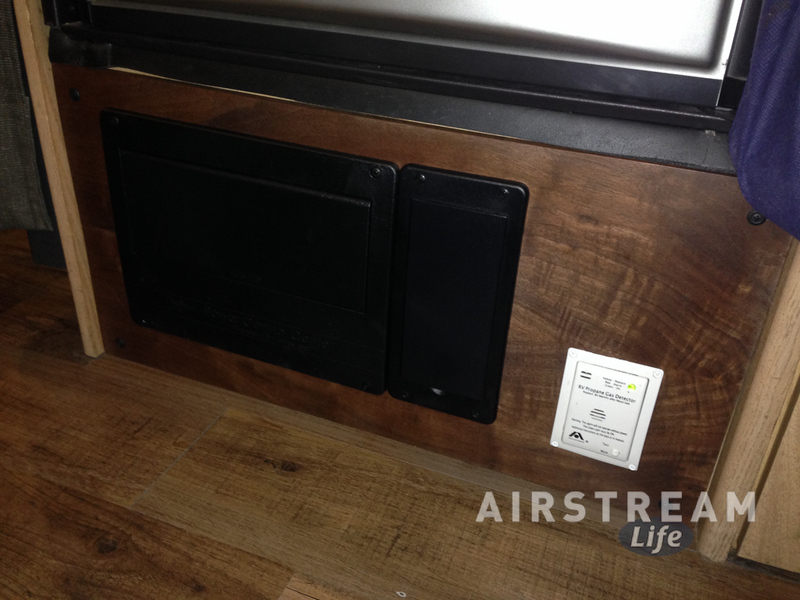 In short the device wasn’t wired optimally, and the result was that we could not plug the Airstream into any common household GFCI outlet without tripping it. That limited where we could “driveway camp” as we traveled last summer, so it has been a priority to get it corrected this winter. Long ago when I installed the Intellipower charger, I removed the lower (converter/charger) section of the original Parallax 7155 power converter-charger and left the AC and DC distribution panels. 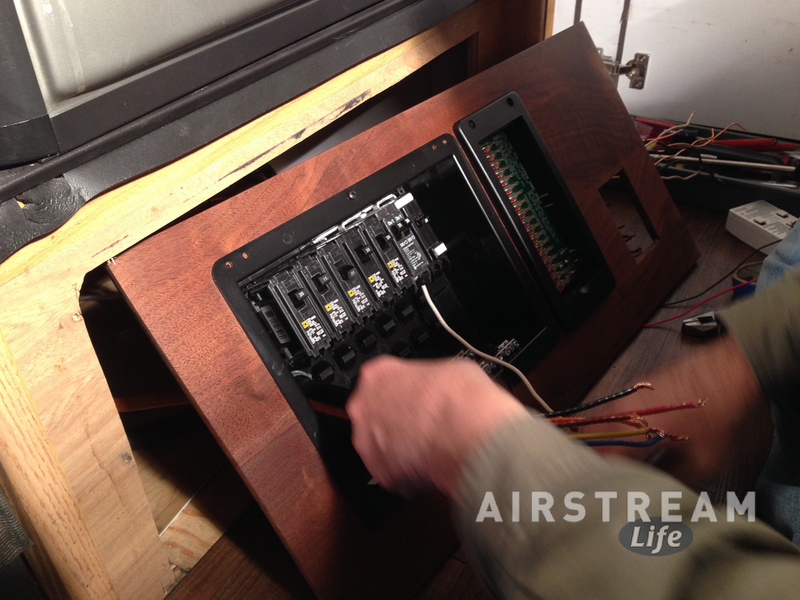 We’ve continued using those original distribution panels, since there wasn’t any reason to mess with them—until now. Our goal here was to install a new AC distribution panel. That’s because it needed to be split into two: a Main panel for the air conditioner and refrigerator, and a Subpanel for the inverter-supplied circuits. Although that isn’t terribly complicated in theory, it triggered an avalanche of other tasks. It started with the panel itself. The only product I could find to fit the bill was the Progressive Dynamics PD55B003 AC panel, and since it didn’t come with DC distribution built-in, I also had to order the companion PD6000 DC panel. That meant we’d be ripping out every AC and DC connection in the panels and re-wiring them all. And since the new panels are physically larger than the original, we needed to cut new holes in the fascia below the refrigerator. And that meant the propane leak detector had to be relocated. The avalanche had begun. We also realized we’d need a completely new fascia built to mount the new AC & DC panels and the relocated propane leak detector. I could have made it myself but it was much easier to hire a local guy who made a beautiful and precisely-cut fascia from 3/8″ black walnut for $60. 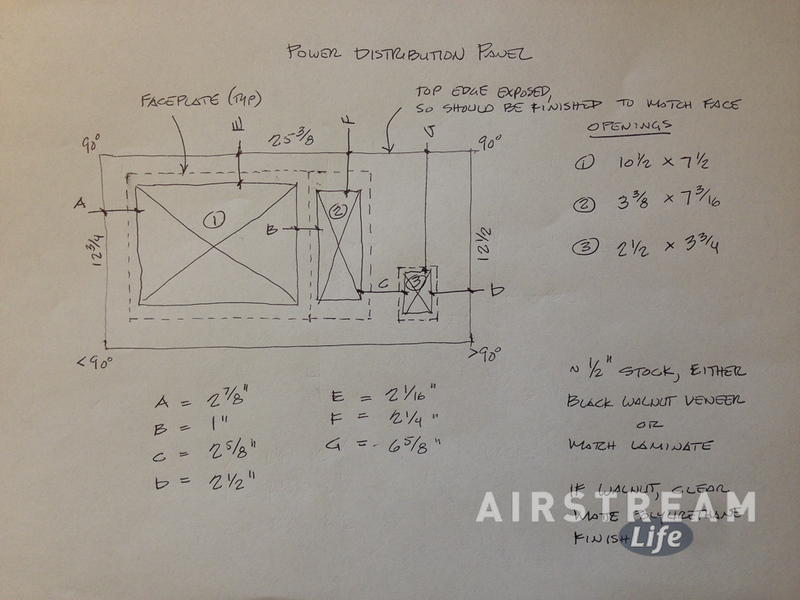 So Nate drew up a very precise drawing to show exactly what we’d need. Suddenly this little re-wiring project was looking a bit more daunting. We ended up with this shopping list: three new circuit breakers, an AC panel, a DC panel, assorted clamp connectors, 5 feet of Romex, GFCI outlet & box, black screws, plus the custom-made walnut fascia. The hardware was easy to get. The woodworking, on the other hand, caused a three week delay. Over this past weekend we finally got started. Like many other “three hour” jobs, the various complications and surprises blew our estimate away. Saturday’s work alone stretched into six hours as a result of minor complications and “might as well” items. We had to remove the inverter to identify the input and output wire colors, since the previous tech didn’t label them and they were hidden from view. There were several other small issues of the same variety, which inevitably result from “working behind” someone else who didn’t take time and care to do things as nicely as we’d like. This is why I prefer to do my own work (or with a good partner like Nate). If we ever have to get into this system again, we’ll find all the wires bundled, labeled, and secured. In the end, the job we that thought would take three hours stretched over three days, with a total of about 12 hours of time invested including runs to the hardware store. To be fair, the wiring part of the job did take less than three hours—it’s all the other “little things” that sucked up the rest of the time. I’m glad we did this. Not only did we get the whole-house inverter finally set up the way I wanted it, but we fixed a bunch of small secondary problems and ended up making the interior look nicer too. The new walnut fascia and the black plastic distribution panels are a big improvement over the way things looked before. We even managed to shave a few pounds off; those original distribution panels were framed in steel and they weighed a surprising amount. 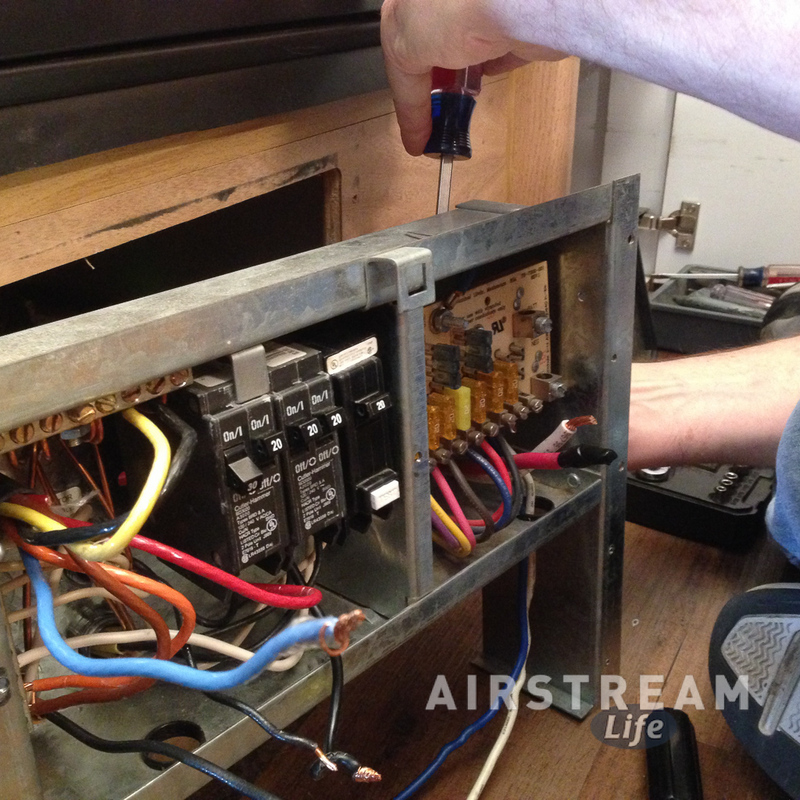 The final challenge was a GFCI circuit breaker that we re-used from the original installation. It was fine right until we pressed the GFCI “TEST” button. Then it buzzed for a couple of seconds and fried itself. GFCIs have a definite lifespan, and this one was 12 years old and had not been tested recently. 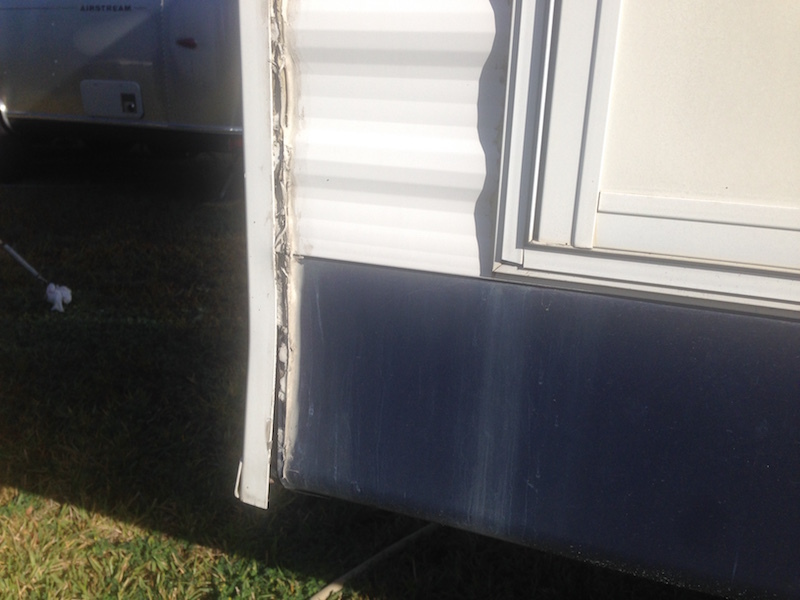 If we’d had an electrical fault in the trailer, this GFCI would not have protected us. When you press the TEST button, the breaker or outlet should trip off instantly with an audible snap, cutting off the power. Then you can press the RESET button to restore power. If either the TEST or RESET buttons doesn’t work, you’re missing a crucial piece of electrical protection that could save your life someday. Time to get a new GFCI.